Beach greetings to you! As you may know I have had sand and sun on the brain for a few weeks now which is perfect because today it's time for our Celebrating Summer Blog Hop. If you arrived via Barbara's blog then you are on the correct sandy path, if you have not been hopping along with us before than you can start back at the Sparkle and Sprinkle blog to learn about the five fun prizes being given away. For my project I wanted to create some embossed polymer clay jewelry. Rather than stamping into raw clay this time I rolled, cut, and baked a piece of polymer then once it cooled it was stamped and embossed with detail black powder. 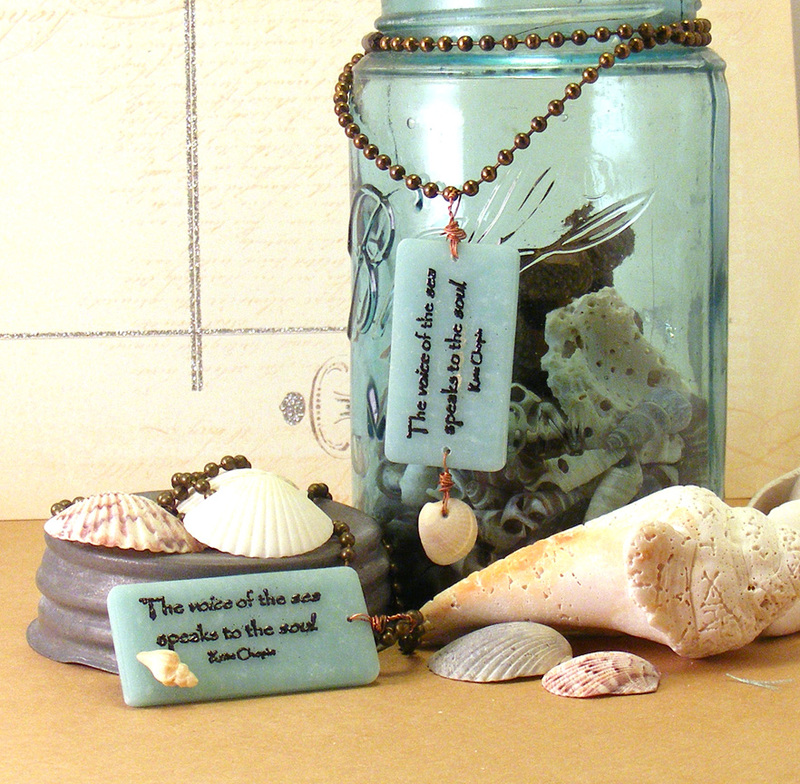 The saying " The voice of the sea, speaks to the soul" is part of a stamp set called Ocean Treasures. After the embossing is finished, the polymer clay can be drilled at the top to make a hole for the bail and again at the bottom to hang a little shell. Be sure to leave a comment...it's kind of like digging in the sand, every once in a while you will unearth a treasure...or in this case maybe dig up a prize. 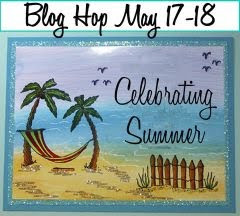 Next you will want to hop over to Karalee's fantastic blog, to see how she is Celebrating Summer. Fabulous! Looks like beach glass and love how you've displayed it! Great job as always! Awesome project!! It is a perfect addition to thje shell or a jar. Would look cool on display in an entryway. Great piece of jewelry! And I agree with Barbara - it's looks just as pretty as a display piece! Very neat and beautifully displayed!! Thats a neat little jar of treasure! Wow - you always come up the best ideas! Very, very cool! Fabulous jewelery! LOVE how you "posed" it with the seashells! LOVE your card too! I want to be there! What a gorgeous idea...making a treasure jar and your ocean theme is perfect for summer time. Jewelry ideas using your stamp sets looks like a fun way to entertain the grandkids. Summer is almost here!~! How awesome is this? What a great idea and I love how you have presented it. Superb job all round. Awesome . Love Shells and the way you have added them to the Jar is great. love the Tags. just perfect. thanks for sharing. Fantastic idea! It would also make a wonderful "fan pull". Thank you for sharing. Cool idea! It came out great! The polymer clay does look like beach glass. I like your take on the theme & the addition of the shells. So many cool ideas and so little time! I love playing with clay. This is a great idea. Very creative!! What a great idea for all kind of things. Looks great with the jar of shells. Love the jewelry piece, but the display is almost as great as the piece! Great job! What an unusual way to use a stamp (at least for me). I really must try this -- beautiful results. Love this creative way to use these stamps!! this is so sweet! What a fabulous decorative item or a great way to show off some vacation memories! Super creative! Quite a different way to use the stamp. Very creative. I love how you made the clay look just like beach glass. Seashells are some of my favorite things. I hope this comment doesn't disappear like the one I put on last evening. Love the combination stamps with clay. What a great idea! It's a really cool piece of jewelry. I love the way you staged it for the photo--a nice beachy setting. Love those pendants! Your work is always so stunning! This is a really cool technique. I'd never thought about embossing baked poly clay before. Thanks for reminding me to think outside the box even more. I appreciate it. Oh, and your pieces turned out fabulously!! This is so cute and I love the colors you used...so summery and beachy! !